Vishakha Nakshatra: Spread from 20 Tula up to 3:20' Vrischika Rashi. The lor ds are Sukra and Mangal, Deity is Satragni, Symbol - a leaf-decked triumphal gate. 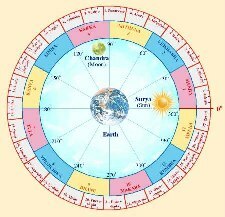 Another name of this Star is Radha, a compliment to Anuradha, the birth star of Surya. He will be full of vigor and vitality and will also have an intelligence of the highest order. He is a firm believer of god and leads a life of truthful existence. He does not believe in the orthodox principles and the age old traditions. He is fond of adopting modern ideas. Mostly he lives away from his family. He is ready to acknowledge others in excess of what is actually required depending on the power of the people he is dealing with. Slavery is suicidal for him. While he is very much religiously active, he does not follow any superstitious or religious fanaticism. He treats all the religions, castes and creed as one. He is a follower of Gandhian philosophy of 'Ahimsa Paramodharma' (Religion is Non-violence) and 'Truth is God'. In certain cases it is noticed that such people accept Sanyasa (saintism) when they touch 35 years of age. When we say sanyasa it does not mean a complete detraction from the 'Grihastashram' (duty towards the family). He will simultaneously look after the family and follow sanyasa.